There has been a pleasant surprise around the farm! At first we thought the cantaloupe harvest was going to be 2. There was a possibility of a third but I did not think it was even close to ever getting ripe but he brought it in anyway and it sat on the counter. I was curious as to what an unripe cantaloupe looked like so I cut it open. So out he went to the garden to pull in all of the other melons we thought were too unready and would never ripen in time. While I still think the three that look like unripe coconuts REALLY do not stand a chance I feel the bulk of these will turn out quite nicely with a little counter sitting. 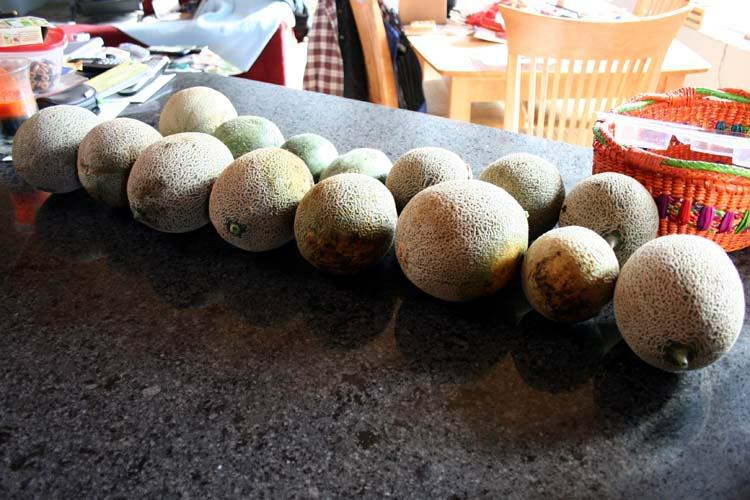 I knew cantaloupes would continue to ripen unlike the watermelons but I was quite happily surprised as to what extent. So it looks like we will be enjoying sweet, juicy melon for some days to come. I love surprises like this!